A pet gift basket is a great idea for any occasion. You can buy pet gift baskets online or you can make them yourself. Personalized cat gift baskets will delight any cat lover, so if you want to impress your friends make it yourself. Designing a gift basket for cat lover gives you the freedom to express your creativity. You can personalize your basket and customize it any way you want. You can make it truly unique. In addition, you can tailor your cat gift basket to satisfy the recipient’s tastes and interests. Does your friend enjoy reading about cats or does she collect cat-themed collectibles? You can include these items in your gift basket. Add a touch of originality by using different types of containers. In addition to the traditional wicker basket, you can also use whimsical containers such as boxes, totes, or ceramic bowls. And, you can have a great time filling it up! As I said before, you can either buy a cat gift basket or design it yourself. Many online stores offer a wide selection of pet gift baskets. Buying a pet gift basket is easy and you have many options to choose from. If, however, you want a custom-made gift basket, check the section below for some ideas. Also, check here for additional help in choosing cat gift basket themes. 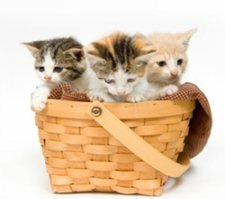 In this section, you will find several ideas and tips to create one-of-a-kind cat gift baskets, either as a present for kitty or as a cat lover gift. Do you want a large or a small container? You can find baskets in different sizes and shapes. You can also choose from a wide variety of styles. If you're going with a traditional basket, you can either pick a wicker or a metal basket. These baskets are found at crafts stores, even at the dollar store. A cardboard box: A great idea is to cover the box with a nice wrapping paper. The advantage of using a box as a container is that there are different sizes to choose from, and it is really inexpensive. For extra originality use a hatbox. A bucket: Buckets come in plastic or metal, and they also come in different sizes. You could also use metal tins and pails. A big cookie jar: This type of container is fun and practical! In addition to regular cookie jars, you can also use cat-themed cookie jars. Another idea is to use a large kitchen canister. You can find canisters in different materials such as glass, ceramic, and metal. A big fruit bowl: This is another fun idea with a practical twist. As an alternative, you could use a large salad bowl. I particularly love wooden salad bowls. A large gift bag: A pretty, cat-themed gift bag can also be used as a container, especially for last-minute presents. Just make sure that the bag can support all the goodies. A wooden crate or box: These boxes make unique containers and they give you lots of space to put all those goodies. You can also find them in different sizes. Tote bag: A large tote bag filled with cat accessories, cat toys, and/or cat books makes a nice gift. If you decide to give a traditional gift basket, use cellophane paper to wrap your basket. Depending on your taste, you can use clear or bright-colored paper. You can also use colorful ribbons to tie it up. You can also use cellophane to wrap buckets, bowls, even boxes! Another option to wrap cardboard boxes is to use gift wrapping paper. For a luxurious look and feel use fabric, lace, or even faux fur! Remember to include in your pet gift basket a nice note or card celebrating the particular occasion. Here are more cat gift basket ideas.